Life is way too much fun to let heartburn get in the way. There’s nothing better than good food and good times with great friends, so wherever life takes you next, bring ROLAIDS Extra Strength Tablets with DOUBLE ACTION for relief from heartburn symptoms. Grab a Rolaids and go! For fast and effective relief of heartburn associated with excess stomach acid. 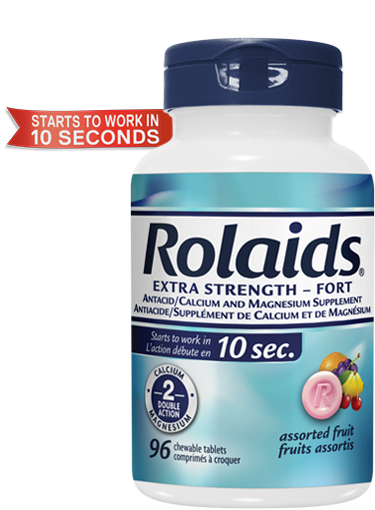 Rolaids is an excellent source of calcium and magnesium. Calcium intake, when combined with sufficient vitamin D, a healthy diet and regular exercise, may reduce the risk of developing osteoporosis. Ask a doctor or pharmacist before using this product. Do not take within 2 hours of another medicine as the effectiveness of the other medicine may be altered. Individuals with kidney disease should not take this product except on the advice of a doctor. Some people may experience diarrhea. Do not take for more than 2 weeks or if symptoms reoccur, unless directed by a doctor. Store below 25°C. Adults: chew 2-3 tablets as symptoms occur or as directed by a doctor. Do not take more than 11 tablets in a 24-hour period. Pregnant Women: chew 1-2 tablets as symptoms occur or as directed by a doctor. Maximum: 5 tablets/day. Adults and pregnant women: chew 1-2 tablets after meal or as directed by a doctor. Maximum: 5 tablets/day. Calcium carbonate contains calcium. Calcium helps to build and maintain strong bones, and ROLAIDS provides an effective serving of this important nutrient. Taking ROLAIDS® is a great way for people who are concerned about calcium intake to supplement their diet with this essential mineral. In addition to being a fast-acting treatment for heartburn, magnesium hydroxide contains magnesium, an important nutrient the body needs for the proper growth maintenance and functioning of bones and muscles. The magnesium in ROLAIDS provides an easy way to supplement this essential mineral for adults. This product might not be right for you. Always read and follow the label. Rolaids® is a registered trademark of Chattem, Inc., used under license. Copyright © 2014 Sanofi Consumer Health Inc. All rights reserved. Last updated: September 2018. Photo credits: Sanofi Consumer Health Inc.
You are leaving the Rolaids website and are about to visit another website which is not under the control of Sanofi Canada.